I’m not one of those people who gives up desserts as a New Year’s resolution. I actually don’t make resolutions at all. But, I’m always so done with cookies, pie, and heavy sweets once January 1st rolls around. 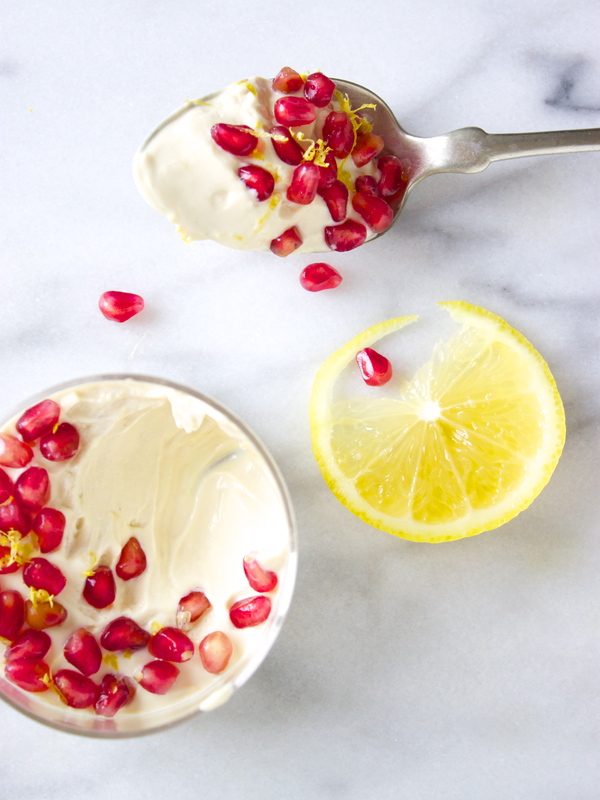 The sweets I crave are on the lighter side (at least for the next month or so), and for whatever reason I was really set on the idea of a lemon dessert this week. 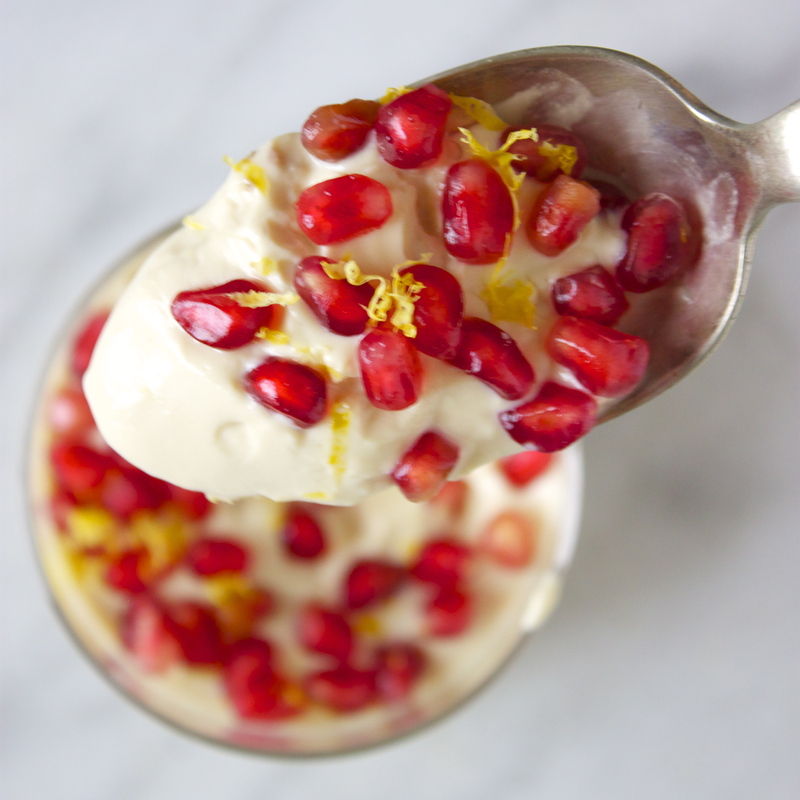 It’s just such an easygoing, refreshing flavor, and extra delicious when it’s in creamy, velvety form. 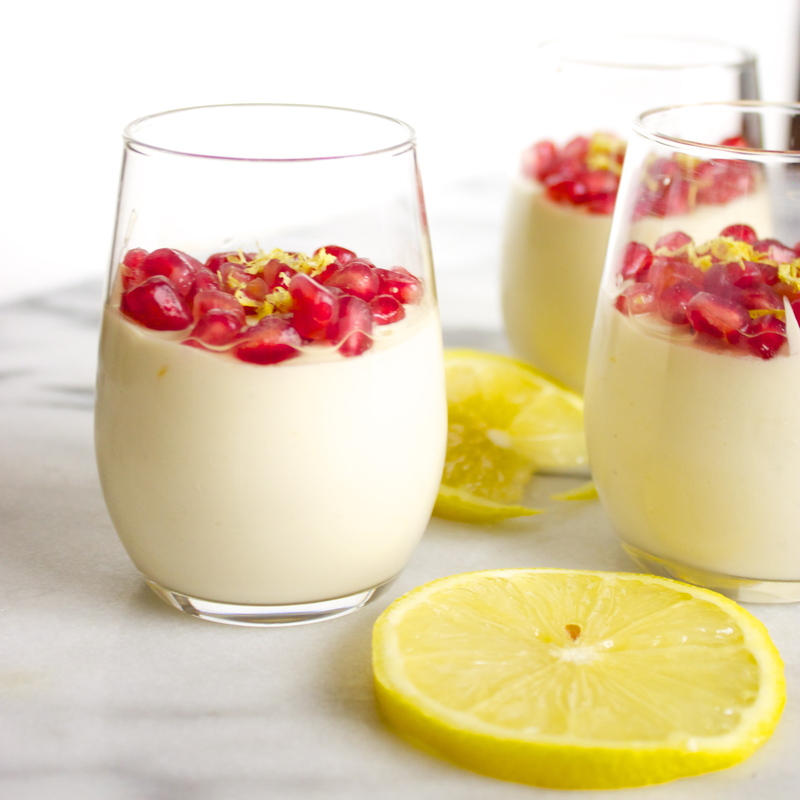 I topped this lemon mousse with pomegranate arils for a little soft burst of berry-like sparkle in each bite. P.S. If you fancy this color combo as much as I do, feast your eyes on these marshmallows. Soak cashews in 1/2 cup lemon juice for 1 to 2 hours. 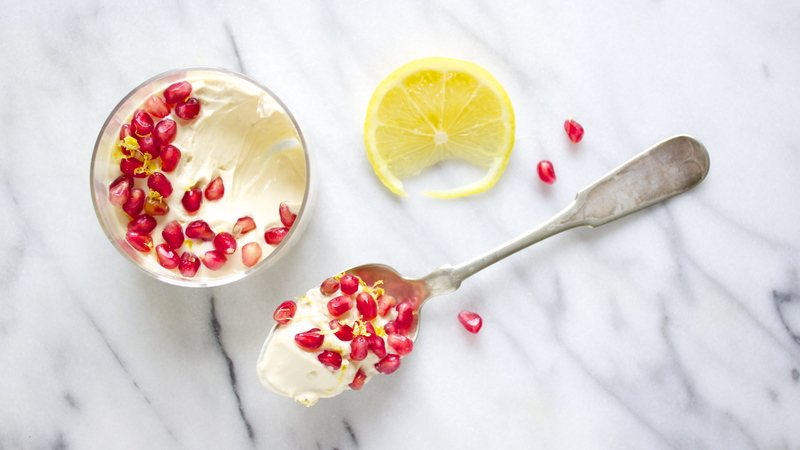 Remove arils from pomegranate. Here’s a video showing how Martha Stewart does it. Use a zester to get all that yellow-y flavor off the lemon. If you don’t have a zester, you can use a potato peeler, but you’ll also want to dice it up. 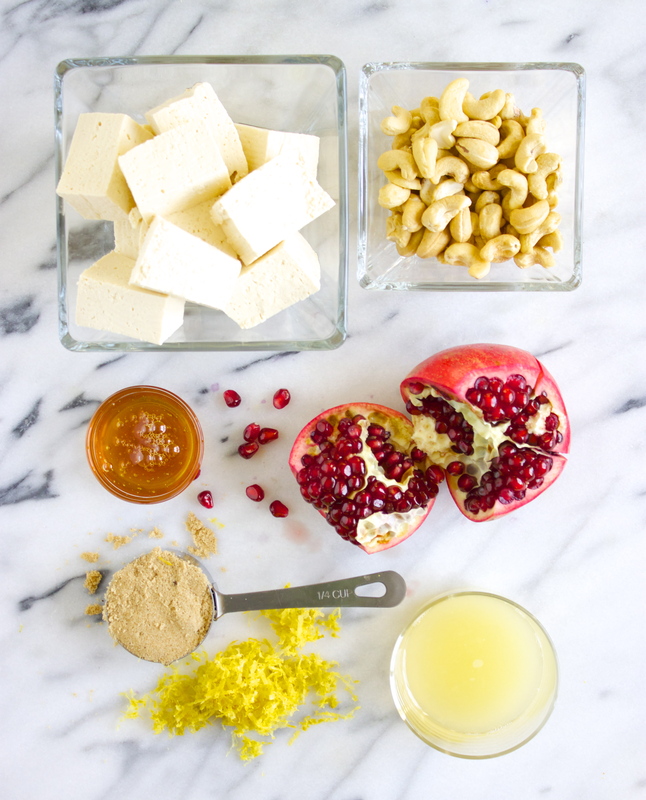 In a blender, process soaked cashews with the lemon juice, zest (save a little bit if you’d like to use some for garnishing), tofu, brown sugar, and honey. Add extra lemon juice or non-dairy milk a little at a time if needed to get the ingredients moving around. Use as little liquid as possible, though. 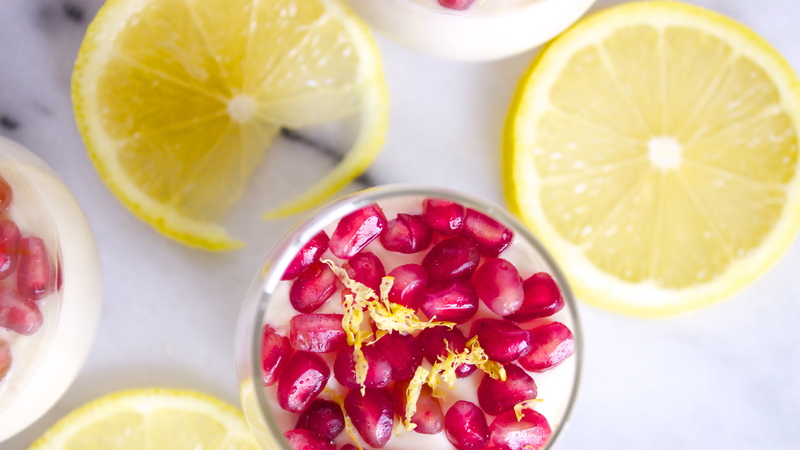 Spoon into serving dishes, top with pomegranate arils, and refrigerate for two hours until set and chilled. NOTE: If your serving dishes have small openings, spoon the mousse into a large Ziploc, snip 1/4 inch off one corner, and pipe into the dishes. Oh, that’s right! Thanks so much, I will update the title! This looks so delicious, can’t wait to give it a try! Thanks so much! This is one of my faves, hope you enjoy it! Was psyched to make this but I don’t eat soy! 😕 Looking forward to your cashew cream cheese recipes! This looks delicious. A great combination of flavours. Thanks for sharing. You bet, and thank you so much!